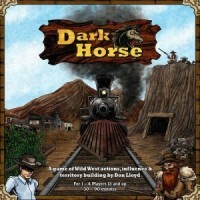 Dark Horse is a board game set in the Wild West with an average playing time of 30 to 90 minutes. The game puts one to four players in the role of a character in charge of a small territory in the old west. Some examples of the characters in the game are Banker, Cowboy, and Tracker. Character have various abilities that give them advantages in the game as well as a starting bonus of some sort. Each player collects and uses various resources to build towns, cities, and rails to grow their territories. Players start the game with one city and two towns with the goal of growing out their territories to include additional towns, cities, and railroad connections throughout the areas that they control. The objective of the game is to collect the most victory points when the game ends. Players do this by expanding their territory, collecting gold, and obtaining Influence Points from certain actions on the game board. Players will need to watch each other’s progress as the game can end in several different ways. Each turn players roll two colored dice and place those dice on a specific action on the game board. The game has built in actions and tokens that allow players to manipulate their dice in certain ways. So players will have to decide whether to use these actions or limited tokens such as the Wild Die tokens to modify their dice. This allows players to use a majority of the dice rolls that come up each turn to further improve their position in the game. The game promotes fast play as each player takes turns placing one or more dice on only one action per turn. 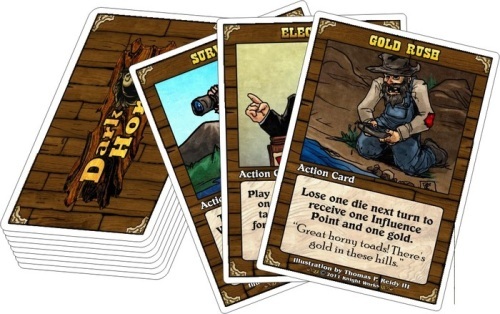 Actions can include but are not limited to drawing cards, collecting resources, building additional towns and cities, and taking special actions such as the Sheriff, Mayor, Trader, or Tycoon. Some actions, such as Rail Baron, require a certain natural die roll while other actions require that your dice add up to a certain value. Players gain influence points during the game by taking specific actions which counts for a players overall victory points needed at the end of the game. 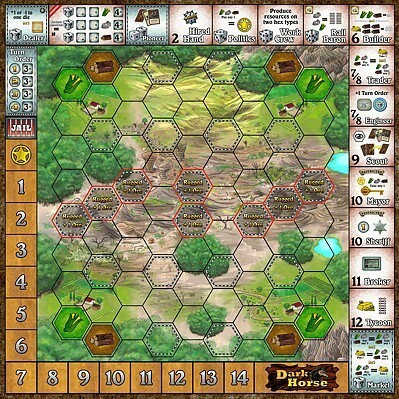 Players will also need to focus on building their railroad connections as efficiently as they can to maximize their score at the end of the game. Add a Review for "Dark Horse"